BEFORE SUNRISE and BEFORE SUNSET directed by Richard Linklater is a terrible reminder of how films affect me and tonight I am highly disturbed by the absurdity of these moment when I know tomorrow I will wake up to live again my PROJECTED best; pick up my recently termed "american flag" bag by another of my 'bored of life' academic colleague and complete my projected self in academia. For the last few months I was limiting myself to write only film reviews in this blog, sadly another sign of the demise of the real "oddexistenz" inscriber. Not that this is going to be any different but I truly believe - Films are a response to LIFE and we don't get many chances of doing that. Very few a times we are honest with ourselves and with a film rolling, the task becomes even more difficult. 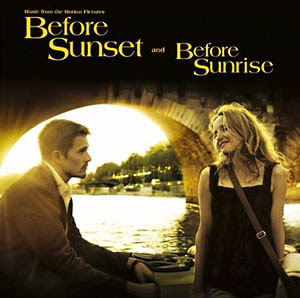 BEFORE SUNRISE and BEFORE SUNSET is about a couple who meet each other for a night and their dream romantic projection comes true; fate has it otherwise and they meet each other again after 10 years with both of their life changed beyond recognition. They introspect and try to get back to bring back old memories and during this process it becomes very clear, that they are not going to let this moment pass. The movie ends with Julie Delphy reminding Ethan of him going to miss his flight, he smiles on and dissolves into molecules in the air.